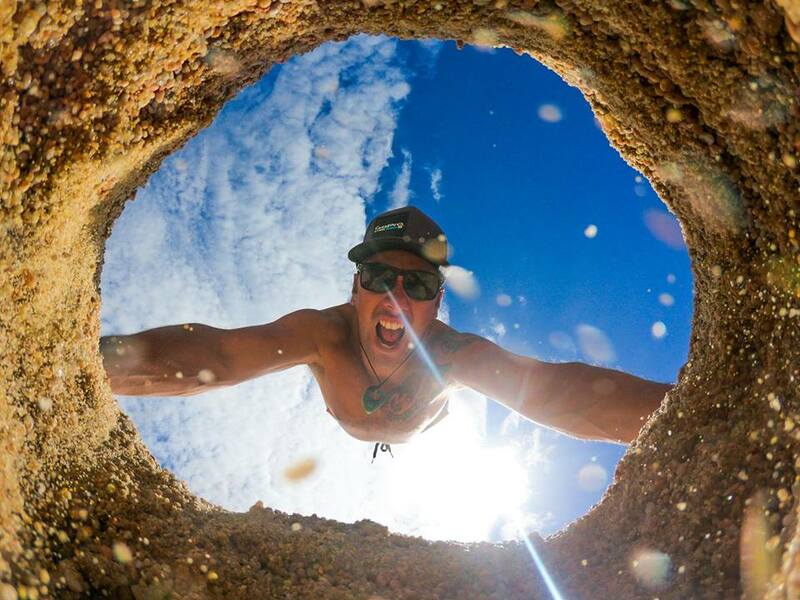 Go-Pro Nation is dedicated to capturing things in the wild. 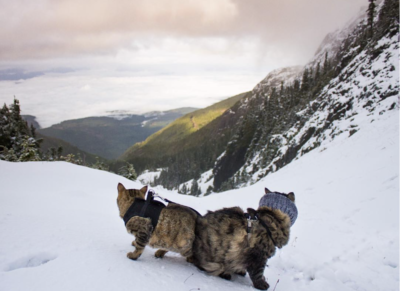 The name of the game is adventures. The experience of 22-year old filmmaker Taiyo Masuda and tour guide Kyle Mulinder proves this point. 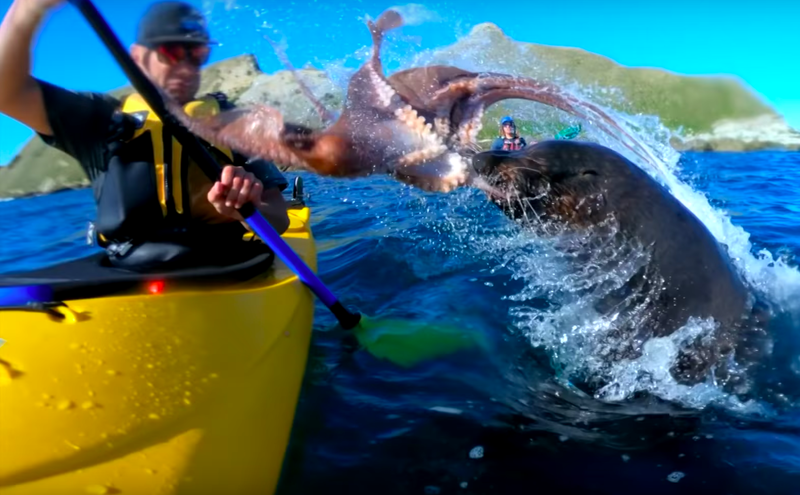 Their kayaking trip turned out to be anything but ordinary when they stumbled upon a fight between an octopus and a seal! The best reason to experience the great outdoors is to see things you can’t experience in the safety of your own home. No Virtual Reality headsets can come close to the real thing. Taiyo Masuda is a filmmaker dedicated to experiencing the world firsthand. 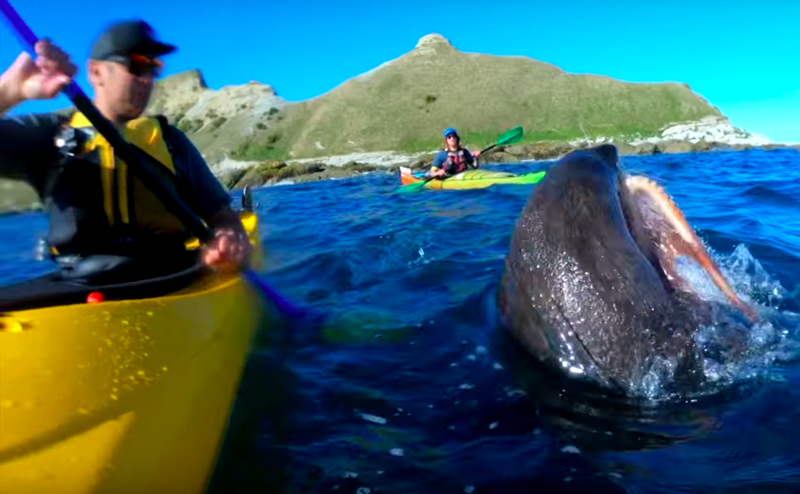 His kayaking trip turning out to be an unforgettable adventure. Mulinder is a born-and-raised Kiwi who grew up on a sheep farm on the country’s North Island. 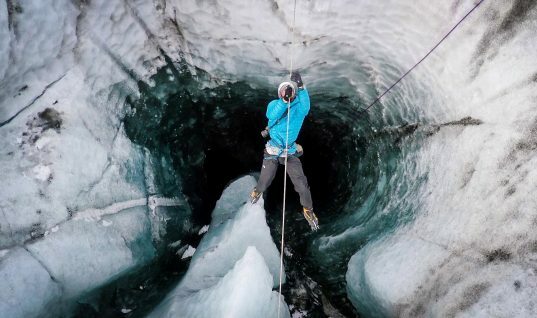 He moved to the South Island to pursue his love of adventure. 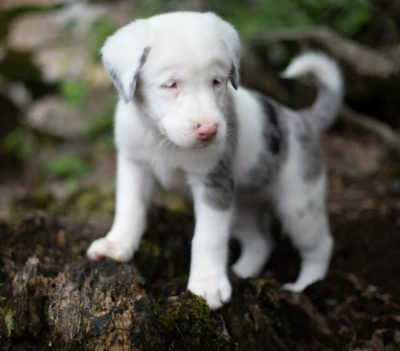 He worked as a rafting instructor before becoming a kayak guide in Abel Tasman National Park. 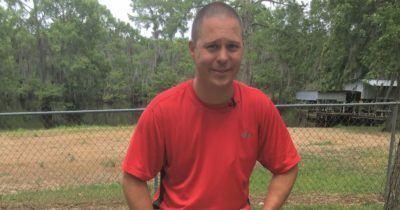 Go Pro works closely with Mulinder because he experiments with their products. 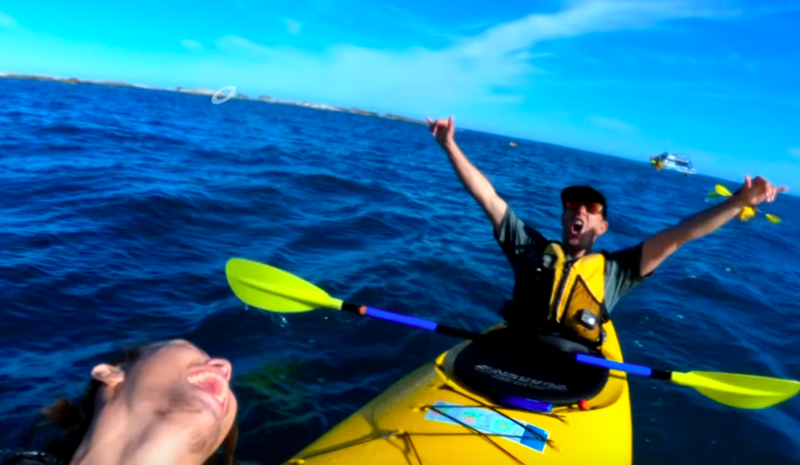 On this day he was trying out a GoPro camera – the Hero 7 – while kayaking with Masuda. 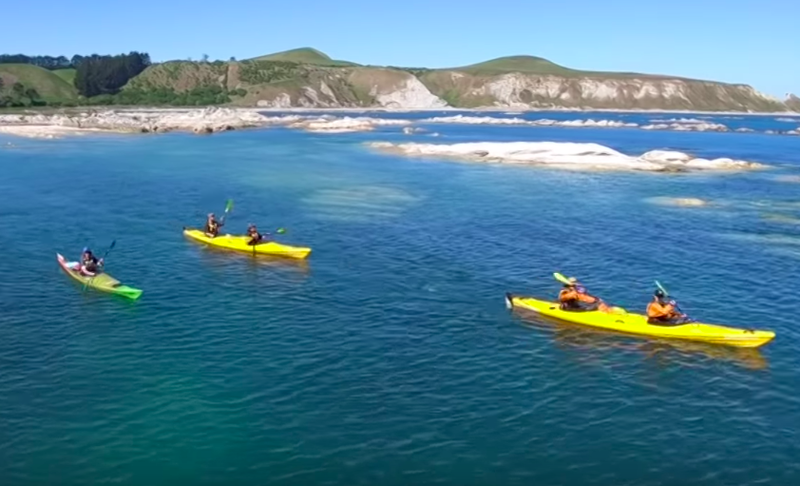 The pair were taking a tour off the Kiwi coastal town of Kaikoura, which is known for its natural beauty and its array of marine life. New Zealand is one of the most magical places on earth. 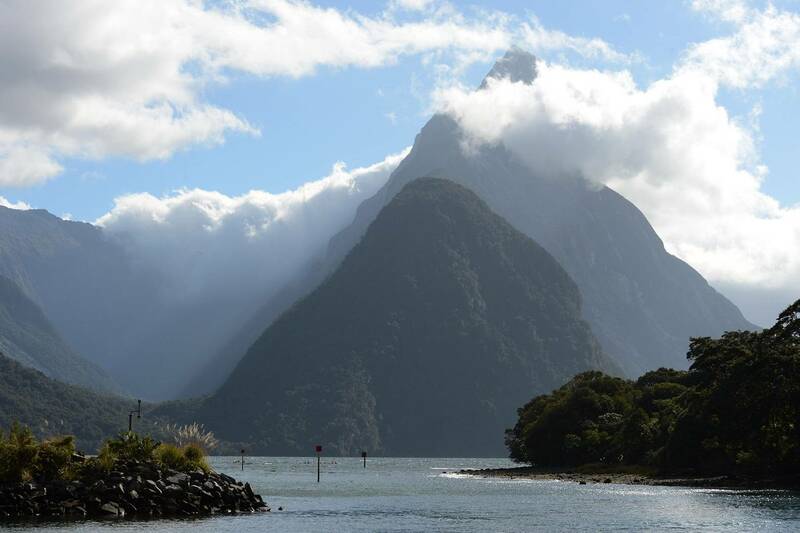 Many people experienced New Zealand for the fist time through the movies in the Lord of the Rings series. But there is more to the island than Hobbits. According to new research, an entire 1.9 million square mile continent is hiding beneath New Zealand, but 94% of it is under the water. There are 8,000 marine species that have been found in the oceans there, and many more exist and are simply awaiting discovery. 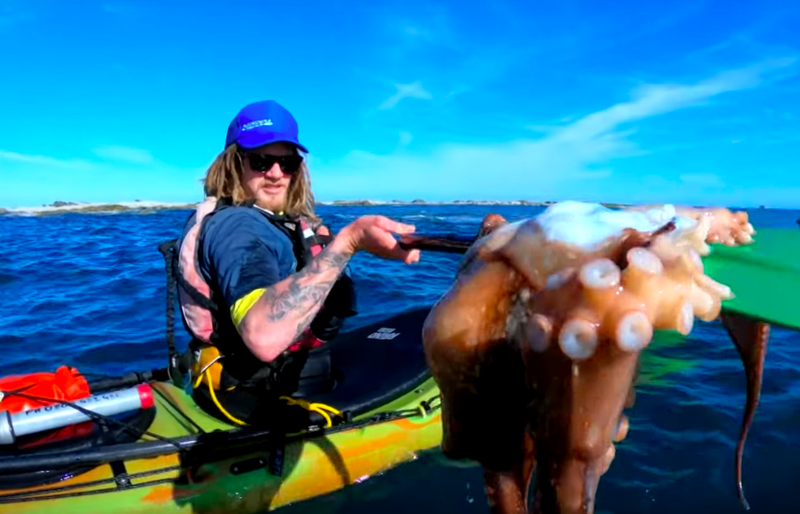 Up on the water’s surface, kayakers and water enthusiasts are accustomed to seeing amazing creatures up close and personal. So Masuda was not initially surprised to see a seal. They tend to hang out sunning themselves on sea rocks or swimming, or even hunting in the water. This trip however, would be totally different. Masuda and his friends had a rare experience watching seals get their hunt on. Seals look cute, but they are nothing like Andre the seal from the 1994 movie. 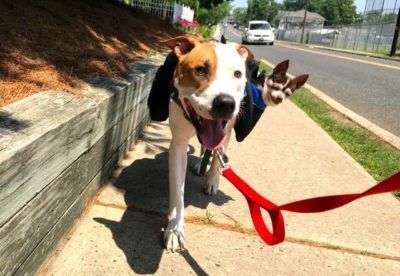 They are known to be seriously ferocious hunters. They have brutally sharp teeth and can swim through the water with speed. Fish are easy to catch and digest. They make easy but unchallenging prey. On this day, Masuda and Mulinder got a front row seat as they watched a seal hunt a very different kind of animal: an octopus. This was proving to be sportier than they ever dreamed. 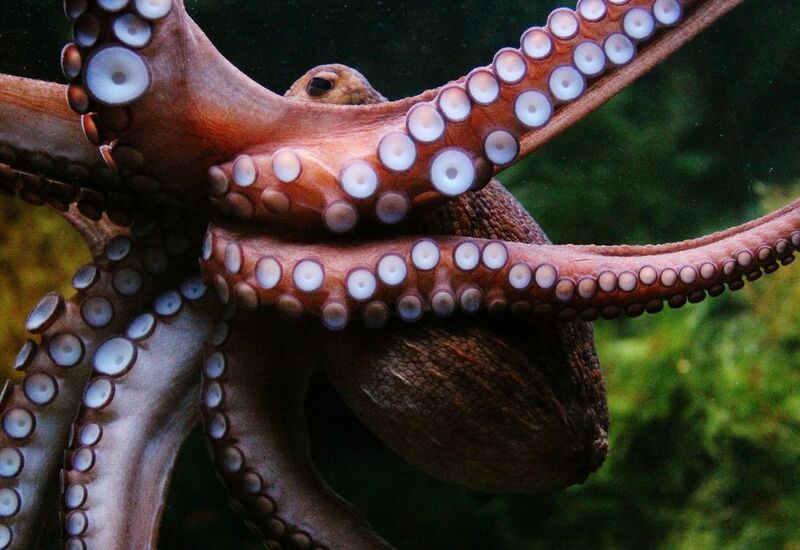 Octopuses are highly intelligent. They have been known to solve puzzles and are infamous for being able to find their way out of aquarium enclosures. Their tentacles are strong and their flesh is far harder to pierce than the average fish. 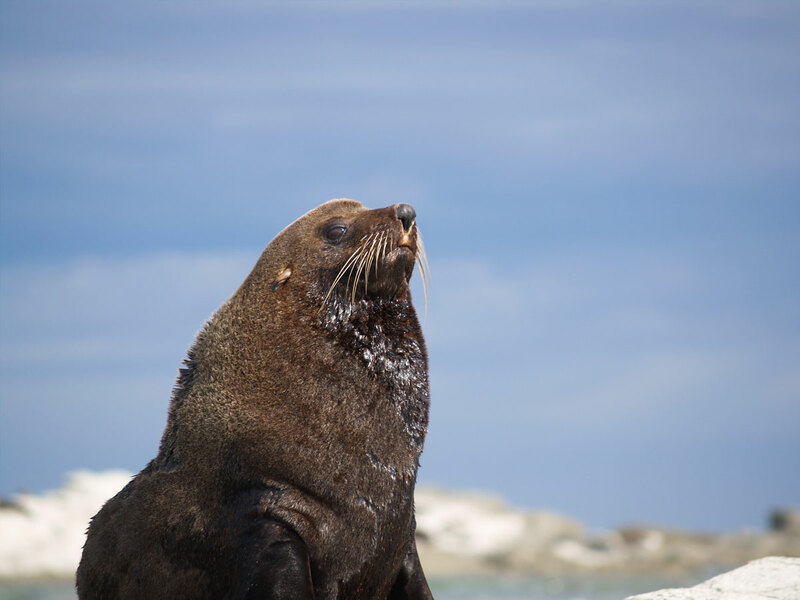 That makes them difficult prey, but like humans, seals relish the challenge. 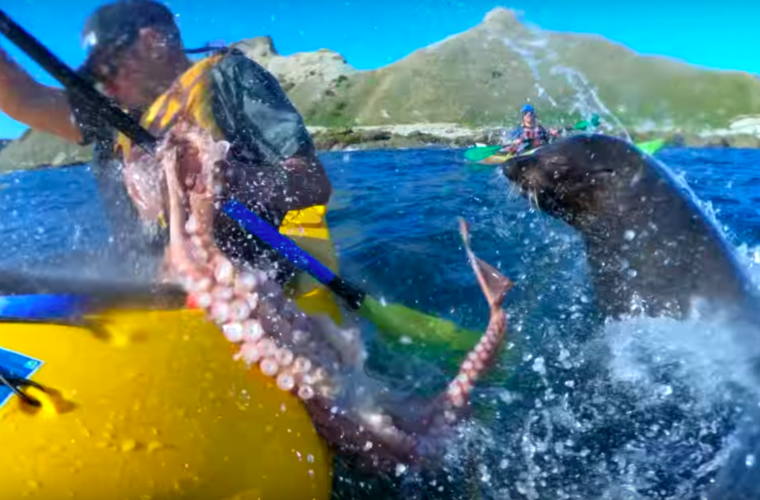 Masuda and his buddies happened upon a fight for the ages: Seal v. Octopus fight to the death. His friend Kyle Mulinder was right in the middle as the octopus battled the seal. He could see them under the water, but then they suddenly vaulted to the surface, with Masuda in the crosshairs. Masuda wasn’t expected to get smacked in the face with an octopus but that’s exactly what happened! The seal rose up and bashed the octopus against Masuda’s face. It happened so quick that it shocked everyone but the Go Pro. Unbelievably, the tough-as-suckers octopus survived the impact of Masuda’s hard head. 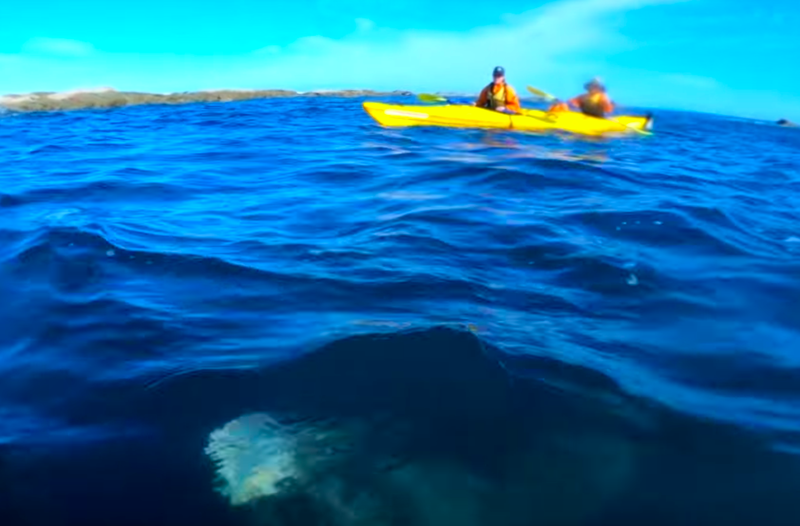 He gets away and then clings to the kayak to escape the wrath of his persistent foe. 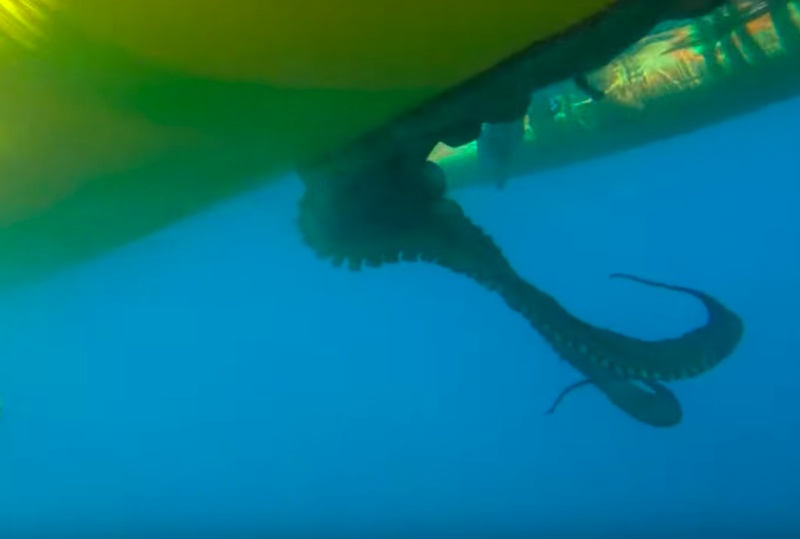 It appears that the octopus got away, at least this time. It appears that this time, the octopus got away from the seal’s wrath. 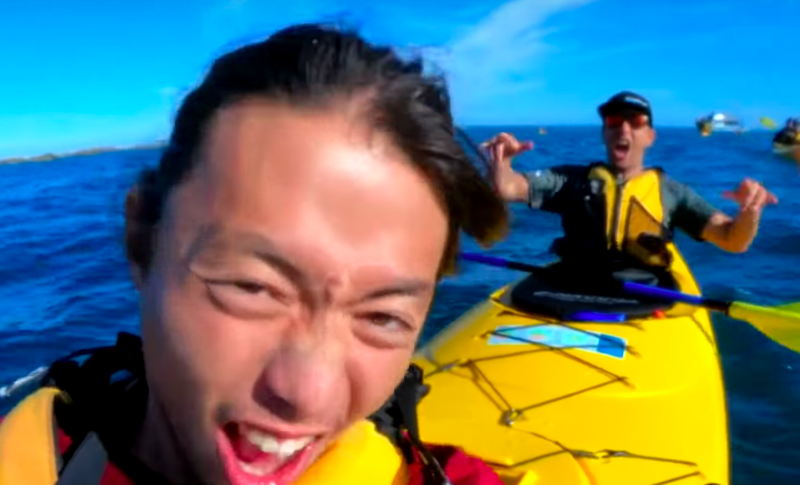 At least as he clung to Masuda’s kayak for dear life for a short period of time. Who knows what happened next though? Seals are hard to beat. The two men will need to wait awhile before they see the sequel.